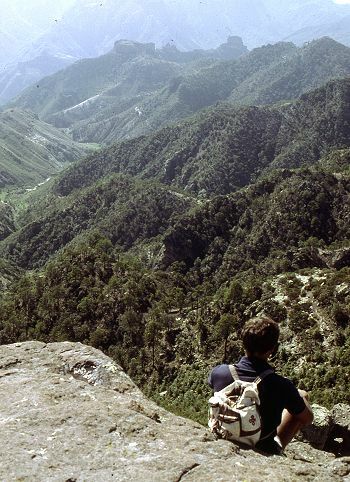 The Copper Canyon area is one of Mexico’s most popular destinations for eco-tourism activities. The canyons offer plenty of opportunities for canyoneering (like mountaineering, but starting from the top! ), wilderness hikes and adventure trips. Mexico’s two highest waterfalls—Piedra Volada and Baseaseachi— are also in this area. The Basaseachic Falls are about 250 meters (820 ft) in height, beaten only by the virtually inaccessible 453-meter-high Piedra Volada falls, also in the state of Chihuahua. The Basaseachic National Park is easily accessible via paved roads from Chihuahua City. Magnificent scenery attracts hikers from all over the world. Photo: Tony Burton; all rights reserved. Adding to the allure of the Copper Canyon region is the fact that it is the home of some 50,000 indigenous Tarahumara Indians with their distinctive language, customs and lifestyle. The Tarahumara are one of the most culturally distinct groups in all of Mexico, famous especially for their long distance running ability and communal spirit. Relatively easy access to this region is possible because of the railway line which runs from Chihuahua City to the lumber town of Creel, close to the canyons, and then skirts the canyon rim before descending to El Fuerte (once the capital of Arizona) and Los Mochis in Sinaloa. This railway is an incredible feat of engineering brilliance, matched by few railway lines anywhere on the planet. The railway is the lifeline of this remote region. ﻿Tourism in this area is not without its discussion points. Tourists place more pressure on scarce resources such as potable water. As noted in an earlier post, tourism has led to changes in the items made by indigenous Tarahumara women. Some hotel developers have viewed the Tarahumara as a human resource to be exploited as a quaint experience for their clients, though others have quite rightly viewed the Tarahumara as the area’s most important assets, one to admire and appreciate for what they are and how they have adapted to the harsh environment in which they live. Should tourists encourage a monetary economy by buying Tarahumara souvenirs? Is there a risk of tourists introducing a disease to which the Tarahumara have no resistance? Should tourists be allowed to pick flowers and collect souvenir rock samples in the Copper Canyon area? What are the pros and cons of tourists giving small items such as T-shirts to the Tarahumara? What items, if any, are appropriate for tourists to offer the Tarahumara if they wish to give them something for sharing their ancestral homeland? Is it right to take photos of Tarahumara homes, such as their cave dwellings? ﻿Bicycle manufacturing in Mexico Is tourism in Mexico expanding?